I love butternut squash in the winter. Squash are great, inexpensive vegetables that can be cooked many different ways, both sweet and savory. If you want to pay a little more, you can also buy them pre-peeled and diced. But then you don’t get any of those great seeds for Roasting. This gratin is a savory side dish that is really flavorful and goes great with roast chicken or beef. 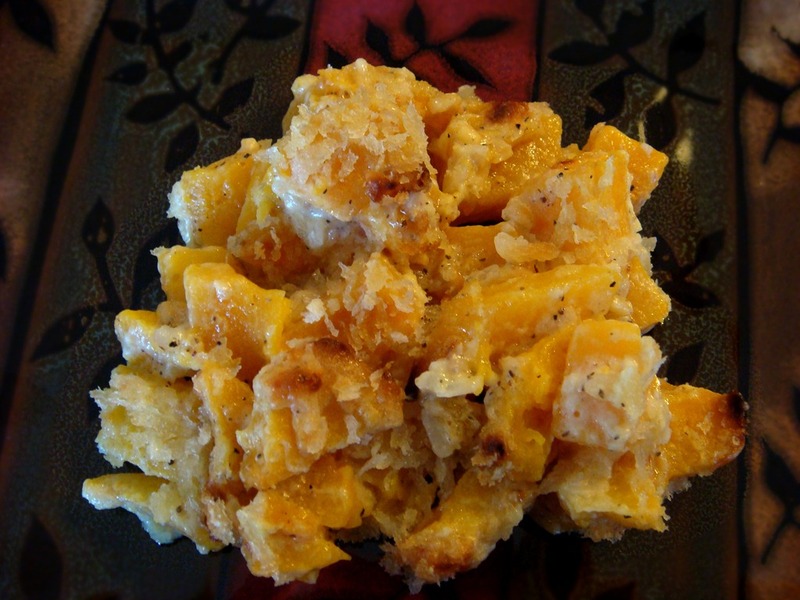 In a 2-quart baking dish, combine squash cubes, garlic, onion, olive oil and pepper. Roast for 30 minutes. In a small bowl, combine cream cheese, cream, bouillon and 1/2 cup Parmesan cheese. Stir into roasted squash. Combine panko bread crumbs and 2 Tbs Parmesan. Sprinkle over squash. Bake for an additional 20-30 minutes, or until bubbly. If topping is not browned, broil for 1-2 minutes before serving. Huge fan of butternut squash – this seems to make it even more delicious! I love butternut squash, especially. I roast it with butter and garlic salt – delish!! Uh – I am NOT worthy. This looks A-effin-MAZING!! BTW… Happy New Year. Cooking, Parenting, Working, Wifing, Writing… not here.